Dorchester, Other Shape Guitar from Richmond. 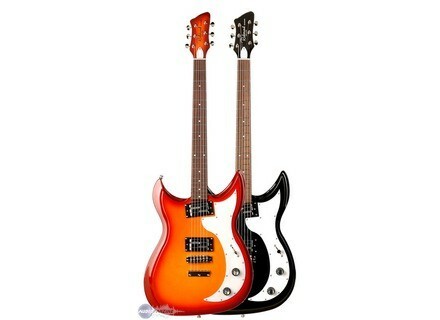 Godin Guitars' new brand Richmond Guitars presents the Dorchester electric guitar, a retro-styled, vintage-looking model. 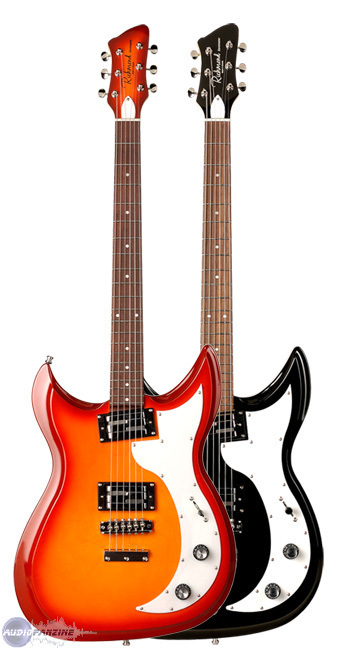 the Dorchester features a 25 ½” scale, two classic sounding Lace Alumitone humbucker pickups. The double cutaway, chambered body is made of a silver leaf maple center and poplar wings. The pickups are controlled by separate volume and tone knobs, along with a 4-way switch that allows you to select between various tantalizing sounds, including the first position which enables the neck & bridge to be in-series, giving the player a fatter tone and more output. The Dorchester’s bolt-on rock maple neck is said to feature the worn in feel of an Ergocut rosewood or maple fingerboard for a comfortable playing experience. It is finished off with high-ratio Kluson tuning machines, a chrome roller bridge with fixed tailpiece, a Nordic white extended pickguard and truss rod cover with matching binding on the back. Fingerboard: Rosewood or Maple 12"
OohLaLa Manufacturing Soda Meiser As the 2008 Summer NAMM approaches, let's focus on OohLaLa Manufacturing's Soda Meiser distorsion pedal, one of the brand's new products for 2008.